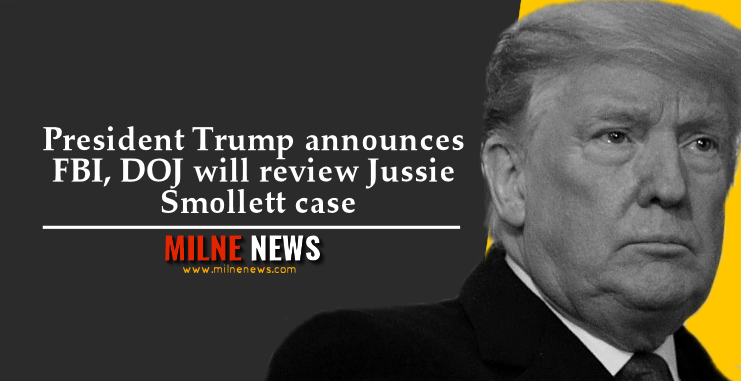 President Trump announced on Thursday that the FBI and Justice Department will review the “outrageous” decision to drop the charges against Jussie Smollett. Trump weighed in on abrupt dismissal of the charges that the “Empire” actor faked a hate crime, amid widespread speculation over what happened behind the scenes that led to the deal with Cook County prosecutors. In the wake of the decision, an internal email leaked from the office of Cook County State’s Attorney Kim Foxx asked assistant state’s attorneys to dig for any examples to bolster Foxx’s claim that the dropped charges weren’t as uncommon or shocking as they seemed. Foxx recused herself from the case in February but defended her office offering Jussie Smollett “an alternative prosecution model” in a series of interviews Wednesday. The dismissal of charges drew a lot of backlash from the city’s mayor and police chief and raised questions about why Jussie Smollett was not forced to admit what prosecutors had said they could prove in court — that the entire episode was a publicity stunt.